At BIAPRO® we recognize the power and functionality that Spreadsheets provide to processes and data that require flexibility and customization. However, depending on the maturity of the processes and data within Spreadsheets, the flexibility and customization that is the cornerstone of Spreadsheets starts to become it's major drawback. A spreadsheet can quickly create more problems than it solves with unexpected errors, duplicate or lost data, and unverified calculations. The existence of "islands" of information that require a large amount of manual maintenance to tie them together is also a common problem. At times transactional ERP/CRM systems have data across separate functions/modules that cannot be easily combined with native reports which then require manual extraction or input to Excel to gain key insight. Additionally, these spreadsheets begin to hold key business logic or extra data and represent a key source of risk to the business if damaged, deleted or duplicated. For this reason, BIAPRO® provides integration services and software to build DataWarehouse (DW) & Spreadsheet-based Systems to leverage the power of your existing spreadsheets with the robustness of central databases and collaborative functionality. All the heavy lifting is done centrally to integrate all sorts of data from your transactional systems, combined to provide unique insight into your business. Additionally, any extra data that is required but not housed in any transactional system is easily saved back to the central and secure DW, making it easy to backup and share with other people in the organization. With a well designed DW & Excel based System, running your business with customized and compliant spreadsheets is a breeze. 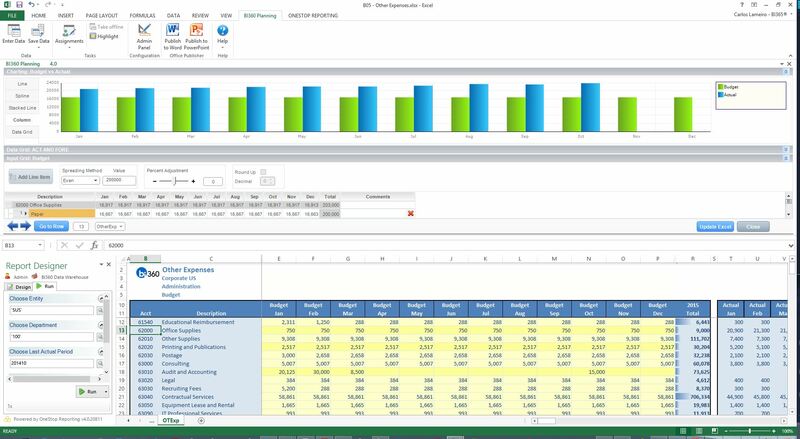 Our DW & Spreadsheet Systems services will alleviate many of the problems that Spreadsheets create for many organizations, making sure that critical spreadsheet-driven processes are properly enabled across your enterprise, providing key Business Intelligence throughout your organization. Lastly, we can help you to ensure maximum compliance with regards to your overall information processing and reporting requirements. 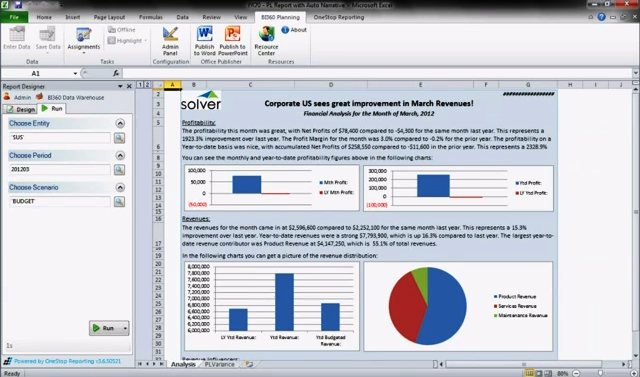 Please take a few moments to browse the following BI360® Videos (from Solver Inc.) to get a deeper insight to the power of Excel and a DataWarehouse. 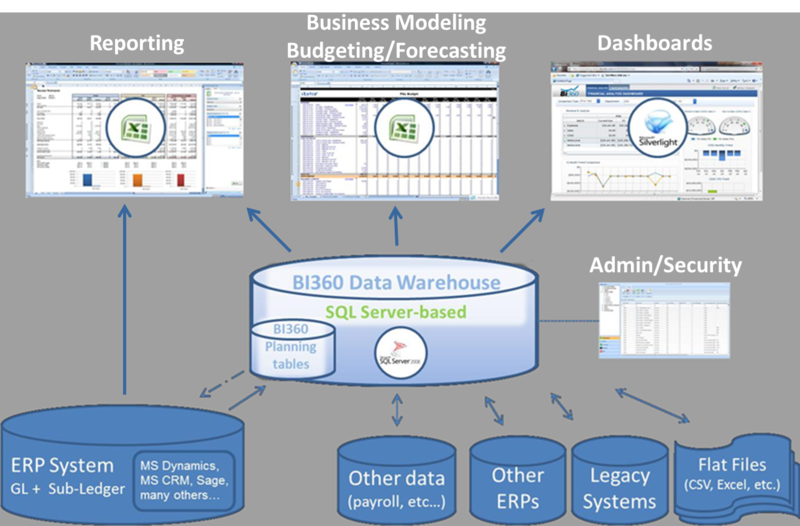 "A great place to start harnessing the power of BI360® from Solver Inc. is to enable the annual Budgeting or periodic Forecasting processes in your organization, most likely driven at present by Excel-files which cause many of the problems indicated above." Please take a brief moment to contact us if you would like additional information, if you have questions that need answers, or simply to schedule a live demo at your organization highlighting your specific requirements. On-demand Narrative Reporting for your Users! We have partnered with Solver Inc. to bring you the best in Reporting, Budgeting and Forecasting solutions using Excel powered DataWarehouse technologies, which is featured in the Magic Quadrant for Corporate Performance Management Suites (2014, 2015, 2016). BI360® is a registered trademark of Solver, Inc.